While biotech stocks ran into the headwinds of disappointing results and clinical trial failures during the third quarter, leading to talk of a second market decline in two years, pharmaceutical shares have mostly had a better year than in 2016. Five factors appear to explain the smooth sailing: Continued sales increases by most blockbuster drugs, more FDA approvals under new Commissioner Scott Gottlieb, M.D., the Trump administration’s proposed corporate tax cut, the absence (at deadline) of any Trump policy proposal directly aimed at rolling back prescription drug prices, and a shift by pharma companies away from blockbuster deals toward smaller “bolt-on” acquisitions. As of November 9, 2017, the NYSE ARCA Pharmaceutical Index rose 7.8% year-over-year, to $535.86—exactly the same year-over-year increase seen by the PowerShares Dynamic Pharmaceuticals ETF (PJP), which closed that day at $62.91. However, the iShares U.S. Pharmaceuticals ETF (IHE) increased just 3.5% over the past 12 months, finishing at $150.31. And SPDR S&P Pharmaceuticals ETF (XPH) stayed all-but-flat, rising 0.4% to $40.75. Overall, the top 10 pharma companies on this year’s GEN list generated a combined $1.722 trillion in market cap, up 9.8% from the $1.568 trillion racked up by the drug developers on last year’s GEN List of the Top 10 Pharma Companies, —but up only 5.9% from the combined $1.626 trillion in market cap on GEN’s 2015 top-10 pharma list, reflecting a decline last year in company valuations. This year’s list includes nine of the 10 companies appearing in 2016. GlaxoSmithKline (GSK) was edged off the list with a market cap of £66.38 billion ($87.29 billion), down 16% from last year. Taking GSK’s place is Eli Lilly, which just missed the 2016 list with an 11th-ranked market cap of $86.63 billion. More encouraging for the top 10 pharma companies: all but one (Merck & Co.) showed increases in market cap from a year earlier. On October 27, 2017, Merck reported a 2% decline in Q3 revenue, to $10.325 billion from $10.536 billion in the third quarter of 2016. Merck offered several reasons for its revenue dip, starting with a $240-million hit after the U.S. Centers for Disease Control and Prevention Pediatric Vaccine Stockpile borrowed supplies of the HPV vaccine Gardasil 9 (human papillomavirus 9-valent vaccine, recombinant). That borrowing was driven in part, Merck said, by a temporary production shutdown stemming from a cyberattack that caused a loss of $135 million in sales. Merck also reported a 3% decline in pharmaceutical sales, to $9.2 billion, largely due to loss of U.S. market exclusivity for cholesterol drugs Zetia (ezetimibe) in late 2016 and Vytorin (ezetimibe/simvastatin) in April 2017, as well as increased generic competition for the antibiotic Cubicin (daptomycin for injection), and biosimilar competition in Europe for the inflammatory disease treatment Remicade (infliximab). 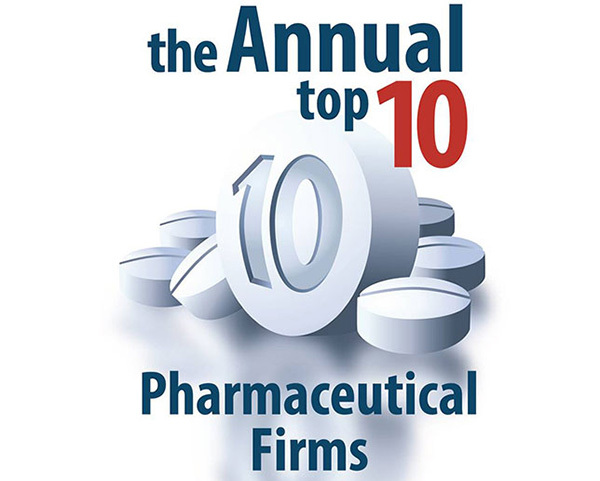 Below is a list of this year’s top 10 pharmaceutical companies, ranked by market cap as of November 9, 2017, as furnished by the companies on their websites; by the exchanges on which they trade their shares; or by other publicly available sources, such as any of several free stock information websites. Figures of non-U.S. companies were converted to U.S. dollars from various currencies on November 9, 2017. 1. Bayer shares are traded in Germany on all seven stock exchanges—the Frankfurt Stock Exchange as well as on the Berlin, Dusseldorf, Hamburg, Hannover, Stuttgart, and Munich exchanges—and in Spain on the Barcelona and Madrid exchanges. In the U.S., Bayer trades American Depositary Receipts (ADRs) through the over-the-counter market. 2. Also listed on the New York Stock Exchange in the form of ADSs (American Depositary Shares); One ordinary share represents two ADSs. 3. Market cap information listed with Roche non-voting equity securities. Roche bearer shares are also listed on SIX Swiss Exchange. Roche’s American Depositary Receipt (ADR) is listed on OTCQX International Premier under the ticker RHHBY.